An oral piercing is a small hole in your tongue, lip, cheek, or uvula made for jewelry. Although some see oral piercings as a way to make a statement, many people do not realize the many complications oral piercings can cause. After an oral piercing is placed, the area that has been pierced is at risk for swelling. Swelling in the oral cavity, especially of the tongue, can make breathing difficult. In some cases, the material used may cause an allergic reaction, causing extreme swelling and complete closure of airway. Any time the skin or tissue is broken, there is risk for infection. Oral piercings are at increased risk of causing infection due to the vast number of bacterial species in the oral cavity. Additionally, those with heart disease are at risk for damage to heart valves when infection enters the blood stream. Gingival recession is the exposure in the roots of the teeth caused by a loss of gum tissue and/or retraction of the gingival margin from the crown of the teeth. This recession occurs in 50%percent of those with lip piercings and 44% of those with tongue piercings. When the gum recedes, it causes the affected tooth to become more vulnerable to tooth decay and periodontal disease. 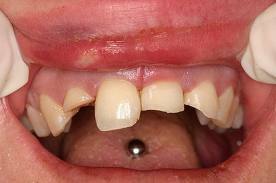 Tooth damage occurs in 26% of those with tongue piercings. If an oral piercing chips a tooth in a way that exposes the nerve, the tooth will require root canal therapy to save the tooth. Oral piercings in repetitive contact with a tooth cause trauma to the nerve. Trauma to the nerve of a tooth can result in nerve death, which can lead to the need for root canal therapy as well. Sometimes trauma from oral piercings damages the nerve in a way that is not treatable resulting in tooth loss. Additionally, long term gingival recession leads to loss of bone. Over time, a tooth with bone loss becomes loose, resulting in the loss of the tooth. The National Institute of Health identifies oral piercings as a possible factor in transmitting Hepatitis B, C, D, and G.
The staff at Adams and Cheek Dentistry does not pass judgement on those with oral piercings. Please feel free to contact us at http://raleighncdentistry.com/contact-our-office/ with any complications caused by your oral piercing.